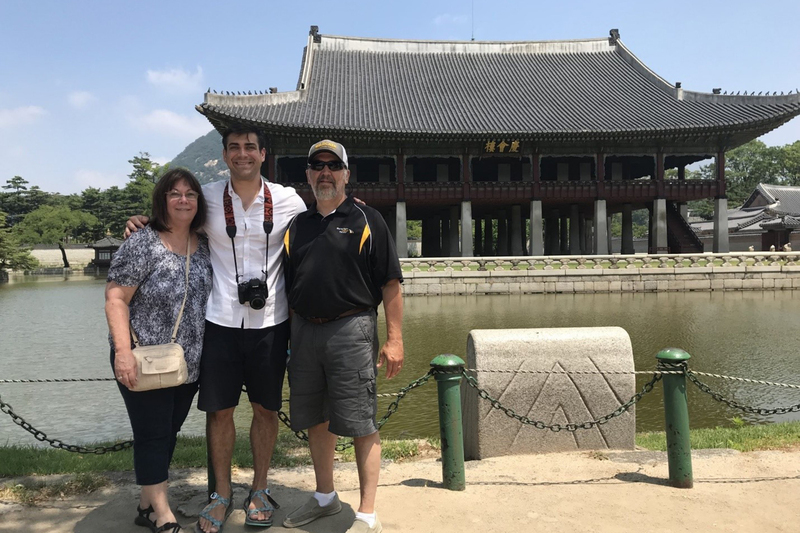 Bren Vander Weil '13 (middle), son of Zoe '80 (left) and Greg '79 (right) Vander Weil, visits Gyeongbokgung Palace in Seoul, South Korea, during a two-year stint teaching English in the country. Where in the world will WSC Wildcats go? Just about anywhere. Bren Vander Weil, a 2013 Wayne State College graduate, recently completed two years (Sept. 25, 2016, to Sept. 25, 2018) as a guest English teacher in South Korea. After that, he took the long way home, meeting other friends and WSC alumni across the globe along the way. In 2014, Vander Weil started teaching with Omaha Public Schools and was settling into what could have been a nice career with OPS, but there was a voice in his head that kept telling him to teach abroad. That voice belonged to fellow WSC alum Jeff Mills. Mills and Vander Weil both graduated in 2013 with teaching degrees in secondary social sciences. Vander Weil went to Omaha. Mills went to Korea. While teaching in Omaha, Vander Weil stayed in contact with Mills and grew more interested in his international experience. So, after two years of public school teaching, an itch for international experience, and with Mills' encouragement, Vander Weil signed up to teach English in Korea. It’s difficult for him to summarize the entire decision-making process and experience, but he has three pieces of advice to share with current WSC students and other Wayne State alumni. First, when it comes to new opportunities, say yes. “WSC taught me how important involvement on campus is for student success. That lesson doesn’t end at graduation,” Vander Weil said. “Saying yes means you’re open to challenging yourself and expressing a willingness to learn. You may never know how many doors closed at the end of a ‘no thanks.’ In my case, saying yes and moving to Korea led to friendships on every continent (except Antarctica … sorry penguins, it just didn’t work out). “Second, people are people. Sometimes, oftentimes, when catching up with folks about living abroad, I'll be asked, ‘What was the biggest difference between Asia and America?’ or ‘the east and west?’ or ‘us and them?’ This question, and all its variants, was something I was also curious about. After two years of experience, a few missteps, countless conversations, and a touch of hindsight, I've found the best answer to be ... there isn't. People are people, and students are students, everywhere. If you're looking for differences, look no further than the person next to you. If one chooses differences as the lens to view the world, it can be very ‘othering,’ taking away the opportunity to learn, to be curious, to accept, and to include. Those chances to explore another way of thinking can be washed away as soon as it becomes an ‘us’ and ‘them’ conversation. Differences are unavoidable, but how you see them is up to you. Since returning from South Korea, Vander Weil works at the Wayne State College Multicultural Center, helping with international outreach. He is also enrolled in 12 credit hours as he positions himself for grad school with the intent of earning a master’s degree in geography. He occupies his free time moonlighting at Godfather’s Pizza and reminiscing about the incredible adventures he’s had himself and with fellow Wildcats.